The U.S. bank prime rate remained at 3.25 percent in July. The latest Federal Reserve meeting concluded near the end of July with no change in U.S. monetary policy. However, while the Fed has not yet raised interest rates, consumers should keep a close eye on conditions that could cause a change in rates on financial products like credit cards whether or not the Fed takes action. For example, employment remains strong, with job growth averaging a quarter million per month over the past year. This has driven the unemployment rate down to 5.3 percent, its lowest level since early 2008. The lower the unemployment rate gets, the more competition for labor starts to put some upward pressure on inflation. Speaking of inflation, with or without wage pressures the trend of the Consumer Price Index (CPI) is decidedly upward. On the surface, the inflation rate of 0.1 percent over the past 12 months looks perfectly innocuous, but that rate is so low largely because of the plunge in oil prices which took place in late 2014 and early 2015. The CPI has risen by more than 1 percent since the end of January, which would put it solidly over 2 percent if that rate continued for a full year. While that is not an especially high rate of inflation, lenders are especially sensitive to price increases, and so credit card companies may be quick to raise rates if it appears the rise in inflation will continue. For now, most credit card rates held steady in July, with the one change due solely to a shuffling of credit card offers from one company. However, consumers should keep a close eye on employment and inflation trends, because these may well signal changes in credit card rates long before Fed policy does. With the removal of one credit card offer from the market, non-rewards consumer credit cards rose to an average rate of 16.82 percent. This pushed the overall average up by 2 basis points, to 17.55 percent. The average rate for student credit cards remains at 17.04 percent, where it has stayed since the end of 2014. With summer vacation entering its final month, this would be a good time for parents to review responsible credit card practices with students who will be going off to college, and show them how comparing credit card offers can earn them lower interest rates. Rates for business rewards and non-rewards credit cards have remained unchanged since the end of April, and as a result the difference in average rates between the rewards and non-rewards categories remained at 0.61 percent. This differential represents the potential cost of participating in rewards programs. To accurately gauge the cost/benefit of these programs, business managers should consider both the payment practices of the company (which impact the extent to which it will have to pay interest) and the value it would get from redeeming rewards. 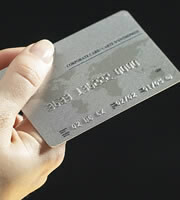 When viewing advertised rates, consumers may notice that credit card companies often list a range rather than a single rate level. This is because the actual rates charged depend on the creditworthiness of specific customers. So, when viewing an advertised range of rates, you should consider whether your credit history is more towards the stronger or weaker end of the spectrum. This is likely to determine whether you are offered a rate closer to the lower or the higher end of the range.